The Eastern Music Festival (EMF), established on the Guilford College campus in Greensboro in 1962, is one of the most acclaimed music educational camps and festivals in the United States. Originally called the Guilford Musical Arts Camp by its founder, Sheldon Morgenstern, then a faculty member at Guilford College, the camp was conceived as a place where talented students could receive professional musical instruction and where students of similar ability and training could perform together. From the first class of 75 students, the EMF has grown to a student enrollment of approximately 200 each year, with competitive auditions for the coveted positions held throughout the United States and several parts of the world. World-class master teachers and trained musician-teachers provide intensive one-on-one and small group sessions for six weeks from late June until early August each year. Students are housed in residence halls on the Guilford College campus, and it is not unusual to hear music emanating from dorm rooms or the shelter of a tall oak at almost any hour. 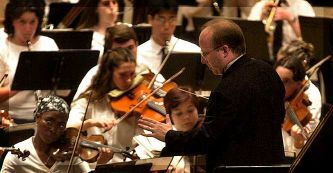 EMF student orchestras offer full classical concerts twice weekly in Guilford's Dana Auditorium, often with internationally known guest soloists. The Eastern Philharmonic Orchestra (EPO), comprised of professional musicians whose winter affiliations include numerous orchestras and schools of music throughout the nation and the world, performs a classical concert every Saturday night of the season. Maestro Morgenstern, who retired as music and education director in early 1998, led the professional orchestra from its founding; he continued to conduct orchestras in major cities in western and eastern Europe as well as North and South America. Edmon Colomer of Spain is the current principal guest conductor, and every season other international conductors are guest maestros of the EPO. Each year, the Eastern Music Festival performs in High Point and Winston-Salem as well as in Greensboro, and it has traveled in the past to other North Carolina locations as well. Project Listen, a program begun in the 1960s, has brought music to people throughout Guilford County otherwise unable to attend the regular EMFseason; locales include hospitals, manufacturing plants, and schools. In all, the EMF provides Piedmont North Carolina with about 100 musical events each year, from solo performances to the popular Tuesday night Eastern Chamber Players concerts and the full orchestra concerts. The students remain the central focus of each season of the Eastern Music Festival. Over the years, scholarship and financial aid programs have been established to assure places for the best students that can be found. In 1985 a gift from Ralph and Janie Price of Greensboro established the International Scholarship Program, bringing students from Japan, Germany, and other locations around the globe; the program continues to be underwritten by Leonard and Tobee Kaplan. Minority and other special scholarships have also been funded by patrons and musicians alike. Alumni of the EMF have been coming back as performers, teachers, and special guest artists for years. They include classical and jazz trumpeter Wynton Marsalis, perhaps the festival's most widely known alumnus; concert pianists Randall Hodgkinson and Gustavo Romero; composer/conductor Carl Roskott; and classical quartet violist Chauncey Patterson. During the months other than the summer season, thousands of the 4,500 EMF alumni hold major positions with orchestras or chamber music groups; teach at music conservatories, universities, and schools; or tour as guest soloists throughout the world. Abe D. Jones Jr., Thirty Gleaming Summers: A Celebration of the Eastern Music Festival (1991). Leslie Mizell, "The Music Man," Business Life (June 1994). Eastern Music Festival. Image available from Visit Greensboro. Available from http://www.visitgreensboronc.com/about-cvb/about-cvb (acessed June 14, 2012).